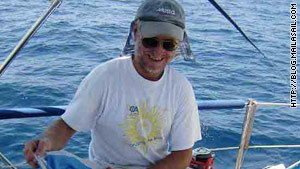 Paul Chandler aboard the couple's boat, the Lynn Rival, in March 2008 as they crossed the Arabian Sea. (CNN) -- Somali pirates demanded a $7 million ransom for a British couple kidnapped aboard their yacht last week, a British agency said Friday. The British government says it won't pay. "The government will not make substantive concessions for hostage takers, including the payments of ransom," the British Foreign and Commonwealth Office said. Paul and Rachel Chandler, who were snatched last week from their yacht in the Indian Ocean, had been held aboard a Singaporean cargo ship hijacked by pirates. They have been moved to a hijacked Spanish ship that pirates have stocked with more supplies and armed men, a local journalist in contact with the pirates said Friday. The pirates moved them to the Spanish vessel after elders in the Somali town of Haradhere refused a pirate request to allow the Chandlers ashore, the journalist said. The journalist's identity is not being disclosed for security reasons. After hours of negotiation, the couple spoke with Rachel Chandler's brother, Stephen Collett, on Friday -- a phone conversation that was videotaped by CNN's British affiliate ITN. In the conversation, Rachel Chandler confirmed only that they had been moved from the Singaporean cargo ship, but not their current location, the network reported. "We're managing. They tell us that we're safe and that we shouldn't worry and that if we want anything, they will provide it in terms of food and, you know, water," an emotional Rachel Chandler told Collett. "They're very hospitable people, so don't worry. ... Physically we're fine; physically, we're healthy." "Rachel and I are here. We are fine," he told Collett. "We know nothing here. It is nice to speak to you. I can only say we are well and that's as far as I can say." Collett read a message to the captors, asking them to release his sister and her husband to show "your compassionate nature." ITN reporter Angus Walker noted that Paul Chandler's tone sounded more strained than during their conversation Thursday, when he laughed at one point and sounded more relaxed. In their Thursday conversation, Chandler told ITN that men with guns had boarded the couple's yacht, demanding money and taking everything of value. Paul Chandler spoke later with the BBC's Somali Service, reportedly saying, "We are well and being looked after OK." He said they were being fed and "food is OK at the moment." The pirates abandoned the Chandlers' yacht, the 38-foot Lynn Rival, which the British Royal Navy found drifting in international waters Thursday. The Chandlers set off from the Seychelles islands on October 21 bound for Tanzania, according to their blog. A distress beacon was activated on October 23, according to naval officials. Britain's Foreign Office said it has been in close contact with the couple's family. Two vessels were attacked the day after the Chandlers set sail. One of them -- a cargo ship -- was successfully boarded and seized off the Seychelles, while the other fought off its attackers near the Kenyan coast. Thursday, pirates attacked and boarded a Thai-flagged fishing vessel about 200 miles north of the Seychelles, according to the European Union Naval Force. Attacks in the region have significantly increased this year, according to the International Maritime Bureau, which monitors shipping crimes. But successful attacks have gone down as a result of a strong presence of international monitors. The first nine months of this year has seen more pirate attacks than all of last year, the bureau reported October 21. From January 1 through September 30, pirates worldwide mounted 306 attacks, compared with 293 in all of 2008, it said. 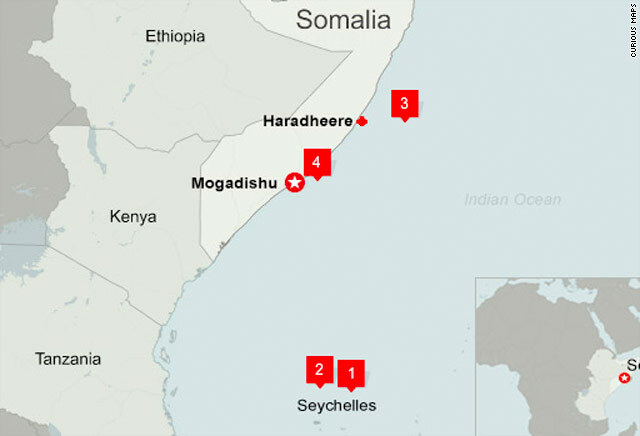 More than half of this year's attacks were carried out by suspected Somali pirates off the east coast of Somalia and in the Gulf of Aden, a major shipping route between Yemen and Somalia. Out of those attacks, Somali pirates successfully hijacked 32 vessels and took 533 hostages. Eight people were wounded, four were killed and one is missing, the bureau said.